306 Beacon is located on the north side of Beacon, between Exeter and Fairfield, with 304 Beacon to the east and 310 Beacon to the west. 306 Beacon was designed by architect Charles K. Kirby and built ca. 1871, one of two contiguous houses (304-306 Beacon) designed as a symmetrical pair. 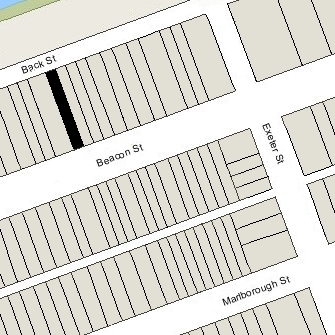 The houses at 304-306 Beacon were built while the land was still owned by the Boston and Roxbury Mill Corporation, probably under an agreement with Charles Kirby. Charles Kirby purchased the land for 306 Beacon from the corporation on November 21, 1871 (the deed noting that “said Kirby having erected on said lot a house in conformity with the restrictions hereinafter set forth”). Click here for an index to the deeds for 306 Beacon. On April 15, 1872, 306 Beacon was purchased from Charles Kirby by Laura Elizabeth (Little) Nourse, the wife of Benjamin Franklin Nourse, a cotton buyer. They previously lived at 9 Beacon. By 1873, they were joined at 306 Beacon by Laura Nourse’s father, Henry Little. He continued to live with them until his death in May of 1878. 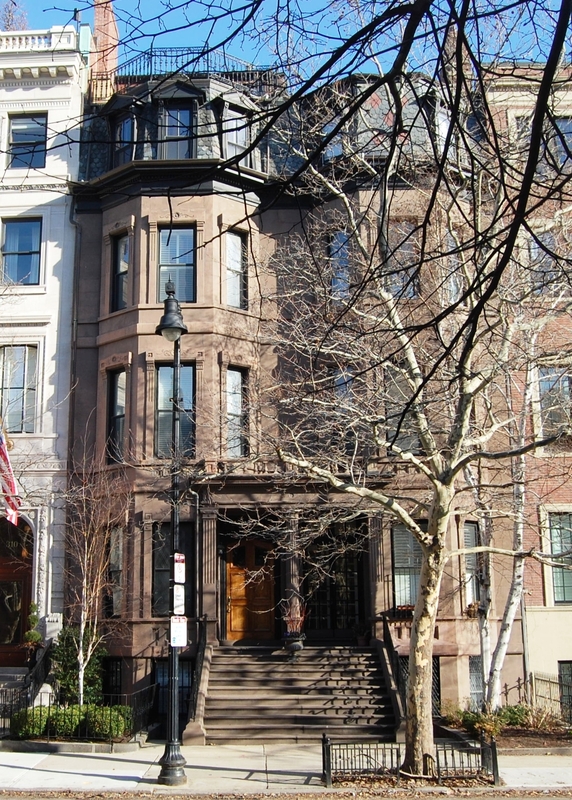 Benjamin and Laura Nourse continued to live to live at 306 Beacon during during the 1882-1883 winter season, but moved thereafter to the Hotel Vendome. Laura Nourse continued to own the house and lease it to others. During the 1883-1884 winter season, 306 Beacon was the home of leather and morocco dealer Andrew Gerrish Webster and his wife, Lizzie Florence (Briggs) Webster. They previously had lived at the Hotel Huntington (Huntington and Blagden Streets). They had moved to 247 Newbury by 1885. 306 Beacon was not listed in the 1885 Blue Book. By the 1885-1886 winter season, it was the home of wine importer and wholesale liquor merchant John Eliot Atkins. He had lived at 9 Gloucester in 1885. He and his wife, Helen M. (Eastman) Atkins were separated (and were divorced by 1900). He continued to at 306 Beacon in 1899, but had moved to New York City by 1900. On November 6, 1899, 306 Beacon was purchased from Laura Nourse by Margaret (Chapin) Bazeley, the wife of William Alliston Ley Bazeley. They had married in September of 1899 and 306 Beacon probably was their first home together. Prior to their marriage, he had lived at 9 Fairfield. They also maintained a home in Uxbridge. William Bazeley was a real estate and mortgage broker. 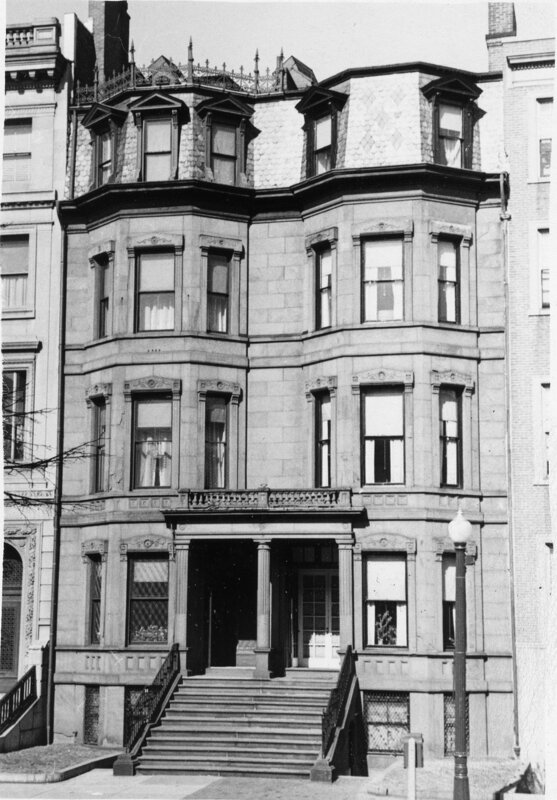 They continued to live at 306 Beacon until October of 1905, when they purchased and moved to 116 Commonwealth. On September 19, 1904, 306 Beacon was purchased from Margaret Bazeley by attorney William King Richardson, who lived there with his mother, Frances Mitchell (Lincoln) Richardson, the widow of Henry Lincoln Richardson. They previously had lived at 329 Beacon. He also maintained a home in Nahant. Frances Richardson died in June of 1924. William Richardson continued to live at 306 Beacon until his death in January of 1951. 306 Beacon was inherited by his sister, Grace (Richardson) Tuckerman, the widow of Leverett Saltonstall Tuckerman. On May 23, 1951, 306 Beacon was acquired from Grace Tuckerman by Ethel Blanche (Carter) Elliott, the wife of Andrew Hartwell Elliott, a civil engineer. They lived at 31 Park Drive. They also owned 373 Marlborough. In May of 1951, Ethel Elliott filed for (and subsequently received) permission to convert the house from a single-family dwelling into three apartments. Andrew Elliott died in October of 1967 in Brookline. On July 20, 1989, 306 Beacon was acquired from Ethel Elliott by Allen Bertram Schwartz and his wife, Ruth S. (Abrams) Schwartz, trustees of the Community Finance Company. In the same transaction, they also purchased 373 Marlborough. On April 3, 1996, William R. Haney, Sr., trustee of the Stetson Realty Trust, foreclosed on a mortgage given by the Community Finance Company to Ethel Elliott (and assigned by her to the Stetson Realty Trust) and took possession of 306 Beacon and 373 Marlborough. On January 21, 1997, 306 Beacon was purchased from William R. Haney, Sr., by Finard Beacon LLC (Todd B. Finard, manager of record). In June of 1997, Finard Beacon LLC filed for (and subsequently received) permission to remodel the property, including extending the rear bay one floor and constructing a garage at the rear. On October 15, 1997, 306 Beacon was purchased from Finard Beacon LLC by SPK Properties LLC (Stephen P. Kaufman, manager of record). 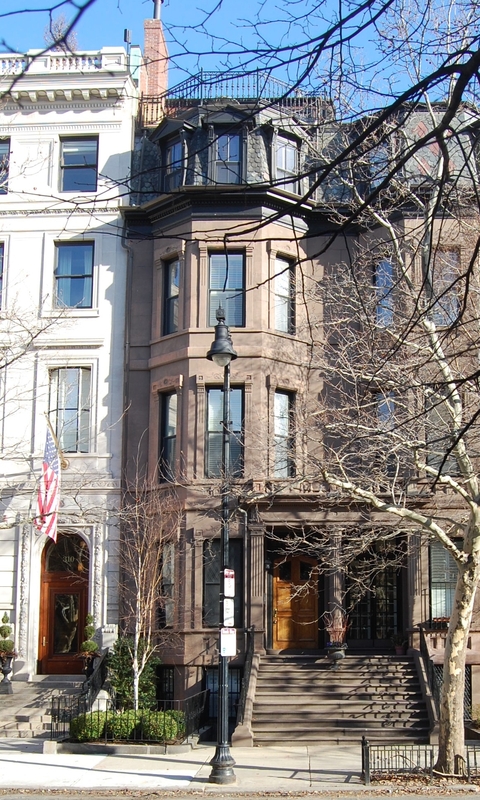 On May 6, 1999, SPK Properties LLC converted the property into three condominium units, the 306 Beacon Street Condominium.